The recent massive leak of records from offshore tax havens includes personal and financial details on people from the president of the West Edmonton Mall to a prominent Ottawa philanthropist to a notorious fraudster. 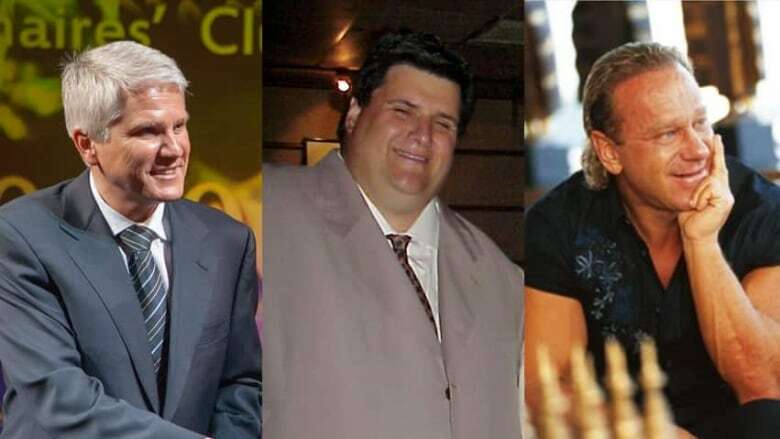 The mega leak of offshore financial records has files on Canadians including, from left, businessman Gerry Hargitai, fraudster Peter Sabourin and fitness club founder Eric Levine. The president of the West Edmonton Mall. A prominent Ottawa philanthropist. A notorious fraudster. A pioneer of internet webcasting. They are just a handful of the hundreds of Canadians named in the recent massive leak of records from offshore tax havens. Some of these individuals come from a few of the country's wealthiest families. Others fleeced their way to fortune. Not all of them even knew they were involved in offshore dealings. A few people were invited to participate in business ventures that happened to be incorporated in tax-friendly locales; one man's name was added as a supervisor on a family trust, by friends, in case something happened to them. Among the notorious names is Peter Sabourin, a Toronto-area investment scammer who owes more than $32 million to victims. His name comes up 1,449 times in the leaked documents. Sabourin was found liable for fraud in two Ontario Superior Court trials in 2007 and ordered to pay $3 million in damages and interest. Three years later, the Ontario Securities Commission dinged him and his companies, two of which were incorporated in the British Virgin Islands, $29.1 million for pushing "sham investment schemes" and lying to investors. Sabourin hasn't been seen since 2007, or heard from in two years. Ontario Provincial Police said they are still investigating him. Some others found in the tax-haven leak have colourful pasts that aren't even necessarily tied to their offshore presence. Montreal-born Eric Levine made headlines last week. The founder of health clubs in California, Hong Kong and Southeast Asia, he drove a Ferrari, dated models and built a $24-million beachfront villa in Thailand. The Canadian government claims it has convicted 50 people of offshore tax evasion since 2006. A CBC investigation has found the government has not accurately reported its conviction rate for offshore tax evasion. Read the story tomorrow at cbc.ca/news. The leaked files disclose evidence of more than $10 million in distributions to him between 2002 and 2006 from a Cook Islands entity called the Braveheart Trust. According to the reports, officials allege the company funnelled $57 million out of Thailand over the last decade while falsely declaring losses on its balance sheet. Adrian Leemhuis, a former bond trader who was fined $50,000 by the Mutual Fund Dealers Association of Canada in 2011 for "extensive and diverse" misconduct as head of the mutual fund brokerage ASL Direct. Gerry Hargitai, a vitamin and health-products tycoon who, in 1992, received a 25-year stock-trading ban in B.C. after the province's securities commission found he "fraudulently misappropriated" $221,000. Mario Aiello, a Vancouver stock promoter linked to companies that have come under scrutiny. In one case, RCMP alleged in 2004 that Aiello was involved in a pump-and-dump scheme, though no charges were ever laid. In another instance, the Vancouver Sun reported he had a role in a company called Supatcha Resources, on which the U.S. Securities and Exchange Commission issued a temporary trading halt after its stock price shot up precipitously over two months in 2010. Not everyone who incorporates a Caribbean company has a questionable past, and certainly there are real business reasons for it. At first, David Ghermezian, president of the West Edmonton Mall and scion of one of Canada's richest families, couldn't recall his offshore involvement in a British Virgin Islands company called Regal Mega Malls Development Corp. "I'm a director of probably 250 companies," he said. He checked into it and called back to say that Regal Mega Malls was a joint venture with Chinese entrepreneurs to develop a mega-shopping centre in China. However, the project fizzled, and records show the company became dormant in 2007. William Mutual, one of the early developers of webcasting and the CEO of Vancouver-based LiveCast, said the company he's linked to in the leaked files was set up in the Malaysian offshore haven of Labuan as a joint venture with the Malaysian government to develop language software. It petered out after the country's former prime minister Mahathir Mohamad left office in 2003, Mutual said. "It was about as legit as you can possibly imagine," he said. Arthur Ross Gorrell, a B.C.-based dentist and president of publicly traded oil-and-gas company Petromin Resources, said the BVI corporation with his name on its books was formed to develop a natural gas project in China with others, but it never took off. Asked why he used a Caribbean corporation, Gorrell said "that was what was recommended by the group at the time. And I guess the business advantage was that it would be easier to get the permits." Shirley Greenberg of Ottawa, a lawyer and heiress to the Minto Developments fortune who was appointed to the Order of Canada for her philanthropy and achievements advancing women's rights, is tied to four BVI companies in the leaked records. Her partner, Harry Stemp, and daughter, Martha Bergeron, also appear. Bergeron said her mother was advised to set up the offshore companies to purchase her home and several rental properties in Barbados, where she used to live for part of the year. There are also Canadians whose names appear in the offshore data apparently unwittingly. "I have no familiarity with that term at all," said Bruce Atkey, a Vancouver Island builder and surfer, when CBC News first told him his name was in the leaked documents associated with a now-defunct entity in the Cook Islands called the Neptune Development Trust. After making inquiries, Atkey discovered he was listed because a couple of his American friends had, in case tragedy befell them, given him an oversight role in the offshore trust they set up. "My friend… put my name on the trust. If anything happened to him and his wife then I would make sure that that trust went to his kids." CBC News initially reported there were at least 450 Canadians found in the huge trove of leaked data. But subsequent inspection of thousands of the more than 2.5 million files unearthed at least 100 more names, and it is thought there may be hundreds more. The colossal document leak came to light April 3 when a global group of media outlets, including the CBC, began reporting it. The files were obtained by the Washington-based International Consortium of Investigative Journalists and shared with news organizations.